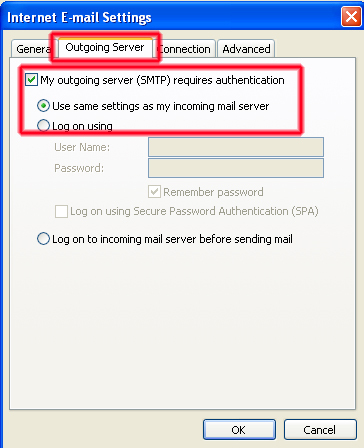 Skyway Mail Server Settings Email Attachments: How Large Can They Be? Please realize these instructions encrypt your email password and secures the transmission of your email, they do not encrpt your actual email content. For password security, CRAM-MD5 authentication is available to mail clients that request it. CRAM-MD5 is an Open Standard. It is NOT the same as Microsoft’s “SPA” which is an Exchange only protocol. Microsoft mail clients cannot take advantage of this password encryption technology. 1. Open Outlook, click on Tools (top menu), and select Email Accounts. 2. Select View or change existing email account and the press the Next button. 3. Highlight your email account in the list and press the Change button to the right. c) Your User Name setting should be the same as your email address. e) Press the More Settings button to continue (see the image below for assistance). The More Settings button will take you a new screen. Press the Outgoing Server tab at the top of the new page. Check the box that says “My outgoing server requires authentication”, and make sure there is a dotted circle on the “Use same settings as incoming mail server”. Now press the Advanced tab at the top of the page. The Advanced tab requires 4 settings changes. First check the two boxes that say “This server requires an encrypted connection (SSL). Now change the server port numbers. 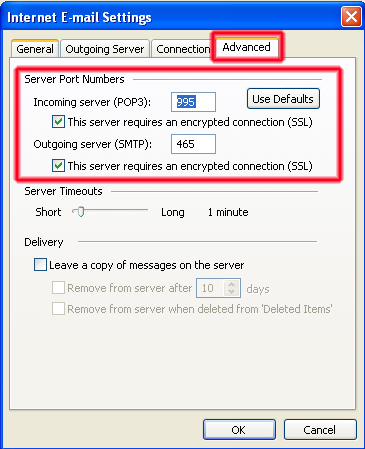 Set POP3 to 995 and SMTP to 465. Now press OK at the bottom of the page, then press Next and finish. That’s it, your done! Feel free to contact support@skywaywest.com if you have any problems or questions regarding this setup. 1. 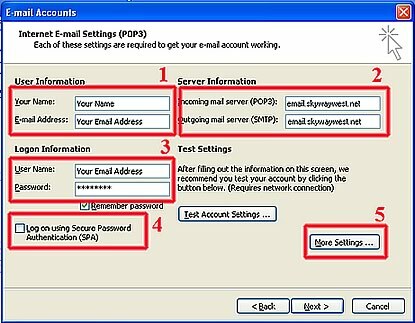 Open Outlook Express, click on Tools (top menu), and select Accounts. 2 . Highlight your email account in the list and press the Properties button to the right. 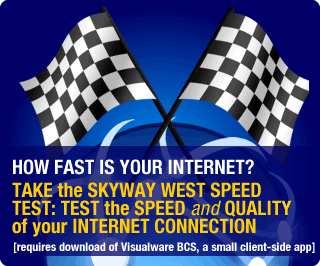 a) Set the Incoming and Outgoing mail servers to email.skywaywest.net. b) Ensure your email address is in the Account name field. c) Check the box that says “My server requires authentication. d) Press the Settings button to the right. 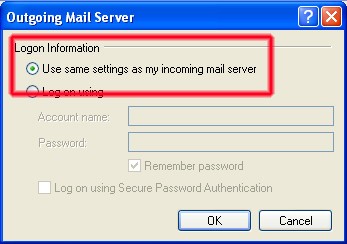 In the Setting box you must ensure the radio button is set On use the same settings as my incoming mail server. Press OK when done and select the Advanced tab at the top of the page. This is the last step. The advanced tab requires 4 settings changes. First check the two boxes that say “This server requires an encrypted connection (SSL). Now change the server port numbers. 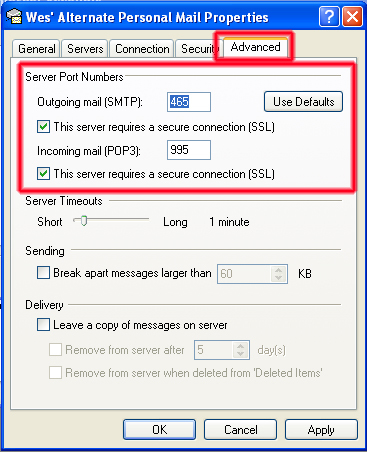 Set POP3 to 995 and SMTP to 465. Now press Apply, then OK at the bottom of the page. Press the close button. That’s it. You’re done! 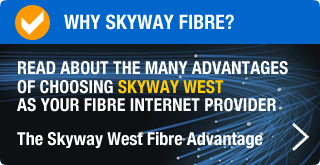 Feel free to contact support@skywaywest.com if you have any problems or questions regarding this setup. c) Ensure your User Name setting is the same as your email address. 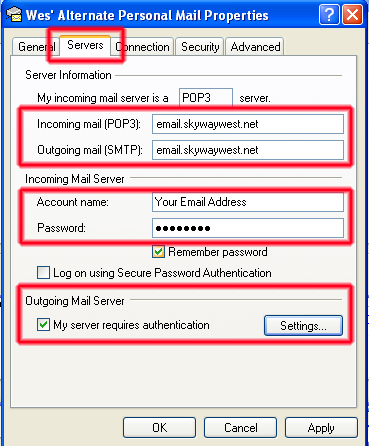 a) Set the Incoming and Outgoingmail servers to email.skywaywest.net. c) Your Account Name must be the same as your email address. e) check the box that says “My server requires authentication”. Press the Settings button to the right.